Warning: this review contains spoilers. Mainly because this is the fourth article I've written this evening and frankly I've lost any kind of subtlety of expression or coherence. This is rather good stuff. Indeed it makes an interesting partner to series 8's Into The Dalek as they raise similar-ish questions about what happens if a Dalek opens its mind to new experiences. 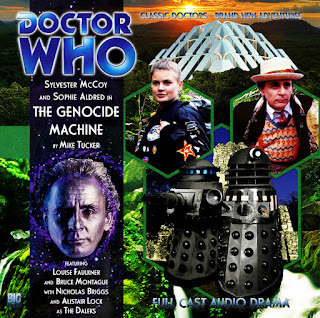 For The Genocide Machine involves the Doctor v the Daleks in a library. Well, sort of a library. It's the kind of library you'd only find in Doctor Who really. It's packed full of the whole knowledge of the universe, which they've decided to hide away on an obscure planet tucked behind a time barrier. The Time Lords helped. It's a library no one really knows about, which makes it a tad pointless as Ace bluntly points out. But its an attractive target for the Daleks as part of a bigger, longer-term plan they've been working on for a while. They want all that knowledge to help them conquer the Universe. The Daleks have taken that phrase about piss poor preparation to an extreme degree. Why just pile in their exterminating everything if you can study the universe and find the weakness of every world? This is the Daleks at their most patient and high reaching. They're not going about this in a half-arsed fashioned and that's admirable. Thing go gang a'glay for the Daleks because obviously they've failed to prepare properly for the Doctor. Even though they're constantly boasting about how they've prepared for the Doctor. Sometimes you wonder how the Daleks managed to get out of their tunnel on Skaro so over-confident can they be. There's a particularly unfortunate Dalek in charge of the whole project whose role is reminiscent of the SpAD that always gets sacked when a politician has done something terrible but manages to avoid the blame. Unfortunately Dalek's don't get to spend more time with their families. There's a rather amusing joke Chief Librarian Elgin (Bruce Montague) and his 'colleague' Cataloguer Prink (Nick Briggs) involving the latter's inability to get a word in edge-ways, which gets a rather impressive pay off late in the story. I like Sylvester in this too, especially as he gets to do righteous indignation. I like a bit of Doctor righteous indignation. They tend to do it well. Especially the Scottish ones. Sophie Aldred is fab doing a very blunt and belligerent Ace. She doesn't take any crap does Ace. The Seventh Doctor and Ace are one of my favourite Doctor-Companion partnerships and this story remind me why. They genuinely sound like friends, which is probably influenced by Sophie and Sylvester's actual friendship these days. It's all rather nice. Being a Dalek story Big Finish have decided to throw in an additional traditional touch: the 'invisible' creature already occupying the planet. With a grudge. There's also the unfortunate Bev Tarrant (Louise Faulkner) who arrives with friends and leaves on her own. The name is very Terry Nation, which is rather lovely. Bev Tarrant could walk into Blake's 7 and no one would have blinked an eye. And finally - and why there's a connection with Into The Dalek - there's a Dalek that gets its mind expanded and suddenly starts behaving in an unusually non-Dalek way. There's hope in this story that Daleks aren't just bad - which also reminds me of some rather lovely work in Dark Eyes - and that given access to the right experience and information they can change. Alas it isn't meant to be. So to conclude. I like this. It kept my attention on the bus to and from work without me ever wanting to look around for something to distract me, although I'm no idea what my eyes were looking at. I think I was happily inside my own head. Unusually.